It’s a very sensuous coupe with twin-turbo muscle and good handling. But it needs to be lighter, with newer tech, blogs Dan Scanlan. Sure, there’s a glossy carbon fiber spoiler, and that stunning “Dynamic Sunstone Red” paint, all atop aggressive rubber. 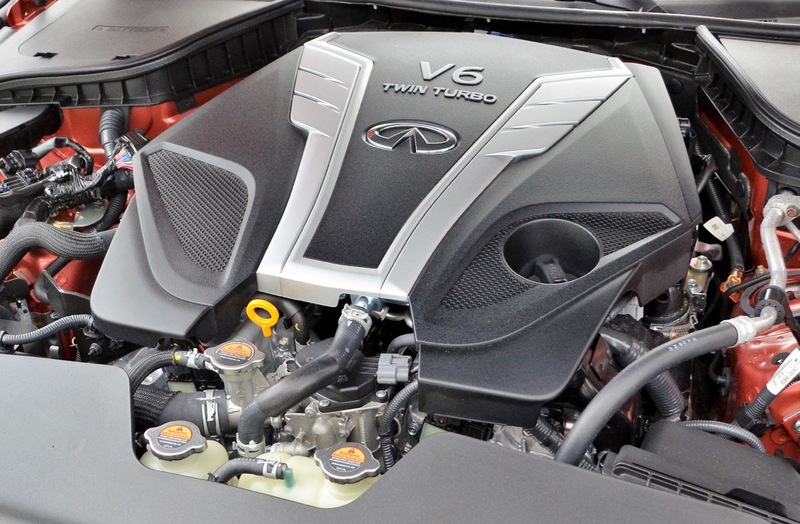 But it’s what’s under the bonnet of almost two tons of Infiniti’s Q60 3.0t Red Sport 400 that stirs the soul as much as the curvaceous coupe’s body – a potent 3-liter twin-turbo V-6 with 300-horsepower, or our Red Sport 400’s 400-horsepower. Our 2,500-mile-old coupe’s turbos kicked in a millisecond after launch, joined with some safety-nanny-spanked wheelspin into second gear as it hit 60 mph in 4.6-seconds. That matched our last Q60 Red Sport, with 100 mph coming in a quick 10.6 seconds. The seven-speed automatic delivered precise shifts when set in “Sport+,” that nudges engine and throttle responses up and cuts down traction control. Tail wiggle was barely handled by stability control during our runs. In “Sport” or “Sport+,” the exhaust had a nice snarl when pedal to metal, but a bit more subtle than I thought it deserved. “Sport” mode was my go-to for suburban driving, with crisp throttle response, tighter steering and a firmer ride. It’s reserved for when you want it; drive mode resetting to “Standard” when you tap it off. And that’s just fine for everyday driving with good throttle response, comfortably firm suspension and nicely weighted steering feel. The car’s “Eco” setting seriously backed off throttle and engine responses as well as lightening steering feel. It was noticeably less responsive off the line unless you dig the gas pedal deeper, but delivered 24 mpg on premium. The double wishbone front/multi-link rear suspension has coil springs and gas-filled, electronically adjustable shock absorbers at both ends. The ride in “Eco” was definitely softer but not mushy. It firmed up a bite in “Standard,” but was more tightly controlled in “Sport” and “Sport+,” still with no harsh rebound over bumps. 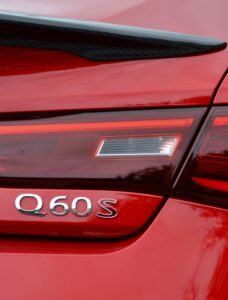 Tackling a highway exit ramp in “Sport” saw the Q60 remain fairly flat and neutral, while sharper turns showed it agile if feeling its weight. We could aim and flow into turns without a bother. “Sport+” let me hang the tail out a bit more under throttle, still catch-able and fun, if again showing its weight. Turn on Trace Control, which applies small amounts of braking to the wheels to correct vehicle trajectory in turns, and the Q60 tackled our skidpad with minimal understeer and real grip. Infiniti’s “drive by wire” Direct Adaptive Steering system offered “Standard,” “Sport” and “Sport+” mode, for progressively more steering feel. Then “Dynamic” or “Dynamic+” ramp up the steering ratio response – “Dynamic” is four percent quicker, and 12 percent quicker in “Sport+.” The result in “Sport+” and “Dynamic+” was super direct steering with a bit of artificial loading up at center, and more feel when turning too. It was still a bit light at slow speeds. Red Sport’s four-piston front and two-piston rear calipers gave our coupe a firm and very controllable brake pedal with short stopping distances, minimal nose dive and no fade after repeated heavy use from high speeds. As for looks, we’ve always loved Infiniti’s curvaceous look, reborn and recurved over the years. 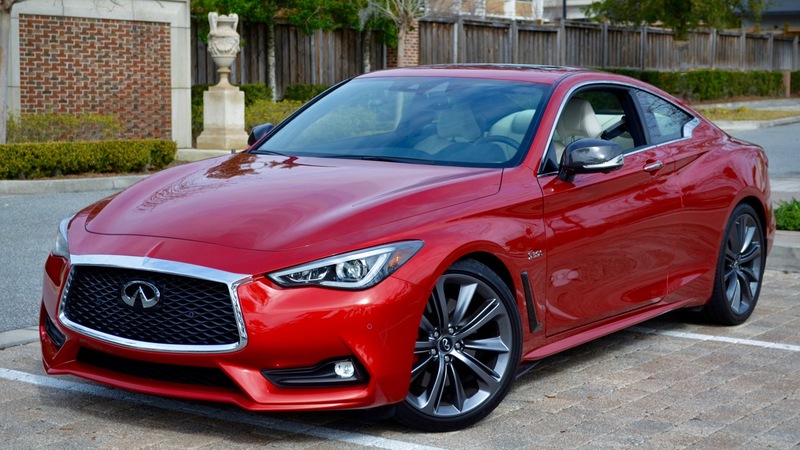 The Q60 gets a very aggressive nose with large rounded rectangular grille and its wavy mesh pattern. Glaring hooded LED headlights with U-shaped DRLs are cut into swept-back fenders. The lower center intake gets a defined air dam with faux side intakes gaining carbon fiber blades with LED fog lights. The coupe squats nicely on bigger 20-inch Bridgestone Potenza RE rubber with bladed 15-spoke forged alloy wheels, staggered with wider rubber in back. Front fenders have carbon fiber vents behind gentle flares, as well as S 3.0t badges. In back, wider fenders with defined shoulders under a reverse chrome accent in the C pillars. Inside, wraparound luxurious, but a bit sterile despite some intriguing weaved stainless steel trim. The doors open wide to a black over white wrap-around cockpit with sculpted buckets, both with 10-way power and heat. 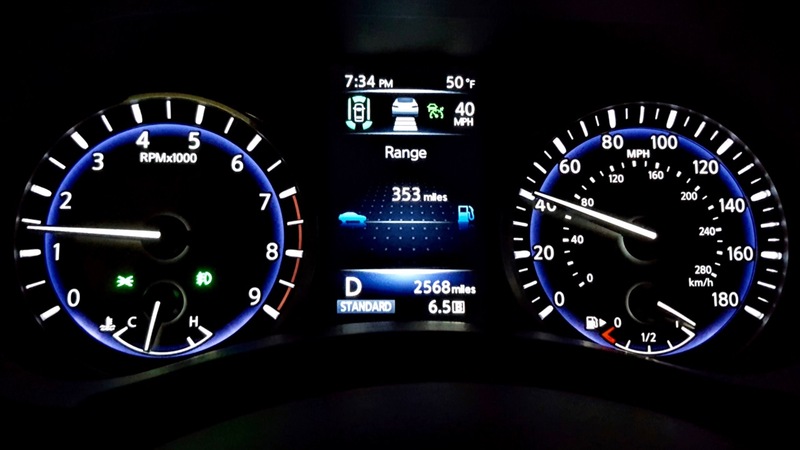 Infiniti’s iconic purple-ringed 180-mph speedometer and 9,000-rpm tach bookend a color display for trip computer, compass/navigation, audio, cellphone and driving/cruise control aides. The three-spoked steering wheel gets a thick stitched leather-trimmed rim with power tilt and telescope and plastic paddle shifters. The back seats are accessible via front seats that power forward. There’s limited room there for adults, with a low center console and cup holders. The rear seat back folds flat to expand a usable 12.1-cu.ft. trunk. 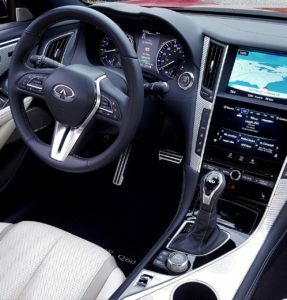 For infotainment, Infiniti has its InTouch twin touchscreens (eight-inch upper and flush seven-inch lower) on the dashboard center stack. Up top, there are navigation or weather radar, plus 360-degree camera. Below it, main navigation, audio that includes SiriusXM Satellite Radio, Bluetooth, Drive Mode selection, sports, stocks, phone and a powerful 13-speaker Bose audio system. Down low, three main physical buttons for “Menu,” “Climate” and “Audio.” Tap “Menu” and the lower screen shows navigation controls, plus phone, information, InTouch Services and Settings. Like a smartphone, a swipe brings more menu buttons for drive mode, driver assistance, HomeLink weather, gas, stocks, etc., as well as a “garage” to park new apps. Like a smartphone, they can be moved. But the main screen icons cannot. 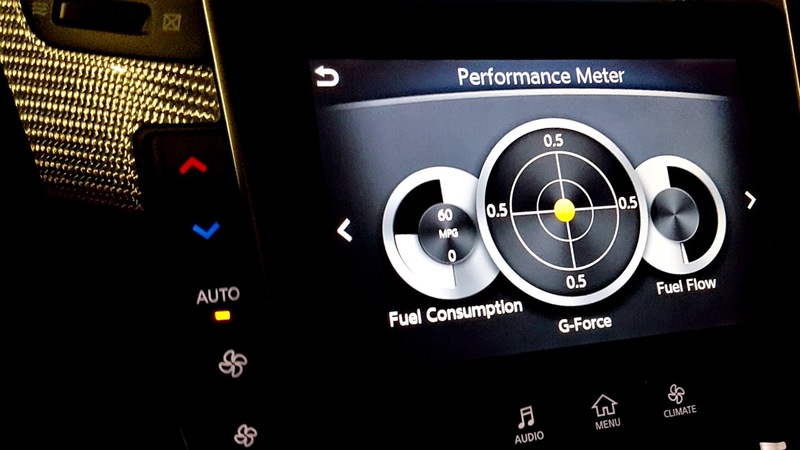 The lower display also shows performance screens with fuel flow, steering angle and g-force meters that don’t go above .5 G. It looks cool, but they aren’t useful! 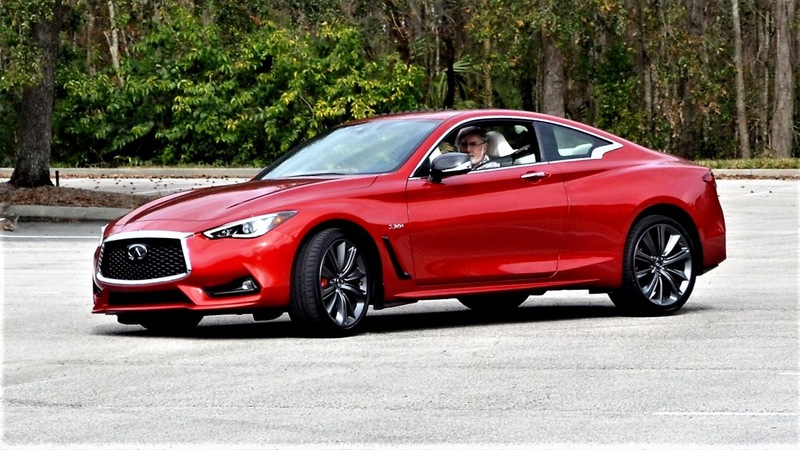 To play, you pay $38,950 for a base Infiniti Q60 (208-horsepower turbo four) 2.0t rear-wheel-drive coupe, while a Red Sport 3.0t with all-wheel-drive bases at $54,000. 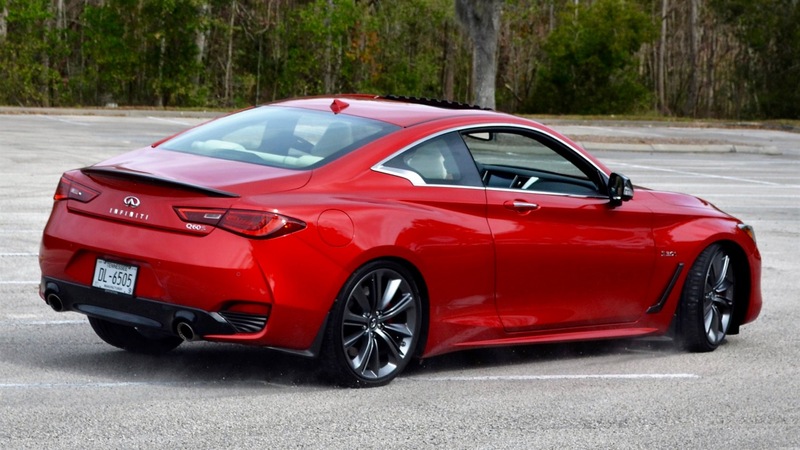 Our 2018 Infiniti Q60 3.0t Red Sport 400 started at $52,000. We had options like a $2,850 Proactive package with active cruise, adaptive steering, lane and distance control, adaptive headlights and more; $2,250 Sensory Package with navigation, heated seats and wheel and remote engine start; $2,250 ProAssist Package with blind spot and rear cross-traffic warnings, around-view cameras, front/rear sonar and collision warning and braking; $2,250 carbon fiber accent package, $800 red metallic paint and silver mesh interior accents; and $400 illuminated “Infiniti” door kick plates. Final price was $63,705 with destination.